The shoulder-fired or ground-fired weaponries that can be carried by a single soldier and are used to destroy any armored tanks, aircrafts, vehicles, and incoming missiles are known as man-portable anti-armor weapons. These weaponries, of the guided as well as the unguided variety, are highly effective against intended targets. Man-portable anti-armor weapons are typically single-shot weapons while some technologically advanced modern varieties are also multi-shot weapons. The demand for man-portable anti-armor weapons has increased at a steady pace in the past few years, owing chiefly to a vast rise in defense budgets of developed as well as developing economies. The rising demand for lightweight anti-armor weapons is encouraging vast developments in the areas of weapon design and technology. This trend is expected to remain one of the key forces guiding the scope of development of the global man-portable anti-armor weapons market in the near future. 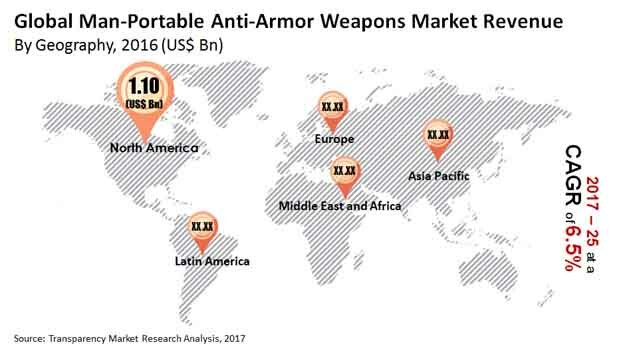 Transparency Market Research estimates that the global man-portable anti-armor weapons market, which in terms of revenue was valued at US$3.64 bn in 2016, is expected to reach US$6.38 bn by 2025, exhibiting a CAGR of 6.5% from 2017 to 2025. On the basis of type, the global man-portable anti-armor weapons market has been segmented in the report into anti-aircraft missiles, rocket propelled grenades, anti-tank rifles, and recoilless rifles. Of these, the segment of rocket propelled grenades contributed the dominant share in revenue to the global market in 2016. Guided rocket propelled grenades are highly effective in destroying targets such as enemy main battle tanks, armored vehicles, and aircrafts at short and long ranges with high precision and are expected to witness strong growth over the report’s forecast period as well. However, the segment of recoilless rifles, which held third-largest share in 2016, is expected to emerge as the most promising segment in terms of incremental growth opportunity over the forecast period. The demand for recoilless rifles is expected to benefit from their increasing usage among the defense forces as the projectiles fired from these rifles travel at a faster rate than most other man-portable anti-armor weapons. The demand for anti-tank rifle was comparatively less among the military forces in 2016, however, the demand is estimated to grow at a steady pace over the period from 2017 to 2025. On the basis of geography, the global man-portable anti-armor weapons market has been segmented in the report as North America, Europe, Asia Pacific, Middle East and Africa, and Latin America. Of these, the market in North America contributed the dominant share of revenue in 2016 due to immense research and development activities undertaken in the field of lightweight anti-armor weapons. Although the North America market will continue to hold a massive share in the global market over the forecast period, the market in Asia Pacific is expected to register the most promising growth rate. This is attributed to the fact that emerging economies such as China and India are investing vast sums in designing and developing new technologically enhanced lightweight anti-armor weapons, while South Korea and other countries in rest of Asia Pacific are regularly procuring these man-portable anti-armor weapons. Some of the leading companies actively participating in the global market for man-portable anti-armor weapons market are Lockheed Martin Corporation (U.S), Bharat Dynamics Limited (India), General Dynamics Corporation (U.S), Saab AB (Sweden), Raytheon Company (U.S), Thales Group (France), BAE Systems PLC (U.K), MBDA Missiles Systems (Germany), KONSTRUKTORSKOYE BYURO MASHYNOSTROYENIYA (Russia), and Nammo AS (Norway). The rapid escalation in the defense budgets across the globe and the need to strengthen the respective armed forces, the defense forces are investing huge amounts in the research and development of latest and robust ammunitions and weaponries. This factor has led the defense contractors to innovate and develop new lightweight, guided and unguided, man-portable anti-armor weapons as well as upgrade the existing weapons. These weapons are used against heavily armored weaponries such as main battle tanks, aircrafts and armored vehicles, sometimes against incoming missiles too. The anti-armor weapons are highly effective in destroying the intended targets, moving as well as static targets. The major factor boosting the market for man-portable anti-armor weapons is the extensive research and development in the defense industry across the world. In recent times, the defense budgets across the globe has increased significantly, which has led the defense forces in the developed countries and developing countries to invest heavily in the research and development of the modern lightweight anti-armor weapons. In addition, the demand for lightweight, highly effective weapons is also increasing among the armed forces as they can be easily transported by a soldier or a group of soldiers to any particular place to target the enemy armored vehicles or tanks. The demand for lightweight anti-armor weapons among the global defense forces is expected to bolster the man-portable anti-armor weapons market. The market for man-portable anti-armor weapons is poised to grow over the period due to various reasons, however is affected by the malfunction of the launchers. The malfunction of the launchers causes disruptions in the flight of the projectiles which hampers the flight. This is a major concern for the manufacturers as well as the infantries across the globe. The risk of malfunction of the launchers is limiting the defense forces to adopt the man-portable anti-armor weapons which in turn is inhibiting the market to grow over the years. The report on man-portable anti-armor weapons market segments the market on basis of types, technology and geography. The various types of man-portable anti-armor weapons widely used by the defense forces across the globe are anti-aircraft missiles, rocket propelled grenades, anti-tank missiles, and recoilless rifles. The rocket propelled grenades contributed the maximum market share in 2016, due to their enhanced capability to destroy the enemy main battle tanks, and aircrafts. This capability of rocket propelled grenades have increased the demand for anti-armor weapons among the defense forces across the globe which in turn led the segment to dominate the market in 2016. The fastest growing type segment is estimated to be the recoilless rifles, growing at a significant CAGR during the forecast period from 2017 to 2025. The recoilless rifles are heavily used by the armed forces against any armored vehicles, tanks and low flying aircrafts. The projectiles fired from recoilless rifles travels at a faster speed than any other anti-armor weapons. Moreover, the recoilless rifles are lightweight and are highly effective against any armored tanks, and armored vehicles. The lightweight armor piercing weapons is being heavily adopted by the military forces across the globe in order to strengthen their armed forces. Geographically, the market for man-portable anti-armor weapons is fragmented into five strategic regions globally as North America, Europe, Asia Pacific, Middle East and Africa, and Latin America. North America dominated the market for man-portable anti-armor weapons market in 2016 with an excellent market share which is estimated to witness a slow downfall over the years from 2017 to 2025. Asia Pacific is predicted to be the fastest growing region during the forecast period from 2017 to 2025. Europe, Middle East and Africa and Latin America are predicted to grow over the period from 2017 to 2025 at a substantial rate. The top ten major player operating in the market for man-portable anti-armor weapons has been profiled in this report according to the strategic five regions globally. The report includes players such as Lockheed Martin Corporation, Bharat Dynamics Limited, MBDA Missile Systems, Raytheon Company, Thales Group, General Dynamics Corporation, BAE Systems Plc., Saab AB, Nammo AS, and KONSTRUKTORSKOYE BYURO MASHYNOSTROYENIYA. The company descriptions includes, SWOT analysis, financial, business overview and strategies adopted in order to sustain in the industry.